Wife. Designer. Photographer. Wellness Lover. Mommy. This post is part of the New Mom Monday series! A series about moms and their advice to new moms! Books and videos can only teach us so much, but there’s something special about hearing from real life moms. Honest, true, and always beautifully inspiring!! ♥ Tell us a little about yourself! I have been married for 9 years. I work as a Branch Manager for a Financial Institution. I’m also a blogger. In my spare time I enjoy spending time with my family, fine dining, laughing, traveling and writing. ♥ How many kids do you have? What are their names and ages? I have two kids. Rain is 6 years old and Sunshine is 1 year old. ♥ How do you find your “me time”? I have to make it! I schedule time during the week to do something for me. If I don’t put it on my schedule I won’t do it. ♥ What is the best baby related book you’ve ever read? ♥ What’s the most useful baby product you have? Why do you love it? The Diaper Pail is the most useful product. I love it. When you have a baby it is the most convenient way to dispose of dirty diapers. ♥ If you could say something to yourself when you first brought home your first baby, what would you say? Get as much sleep as you can when the baby is sleeping. Don’t worry so much and stress less. ♥ How much planning did you do before your baby was born, and how do you think that it helped or didn’t help? I planned from the moment I found out I was pregnant. So for about 7 months I planned. I needed the entire 7 months as my children were not planned. It was definitely helpful although I still didn’t feel ready I don’t think you ever feel ready to be responsible for a new person! ♥ What do you believe are the top three pieces of advice a new mom or someone trying to conceive should know? It’s normal to feel overwhelmed at times. Ask for help those first couple of weeks home. Don’t expect to get back into our regular routine for awhile. ♥ What is your best memory so far of being a mom? When I held both my children in my arms after giving birth. ♥ Give us the short form version of your birth story. My last birth was completely different than my first birth. It was just my husband and me in the room. I had already experienced a difficult birth with my first child. I was expecting the worst. I had a normal 12-hour delivery. Everything went smoothly. I was induced I did have an epidural and was managing my pain well. I did not push for long and when my sunshine was born, it was a relief, she was here. Healthy and beautiful. She was crying as the doctors and nurses check her out. .As soon as she laid on my chest, I rubbed her on her back and said “don’t cry” at that moment the crying stopped. The nurses and doctors in the room paused in a brief moment of amazement. I’m sure they have witnessed these moments many times before but something still makes it special no matter how many times a person witnesses it. ♥ Lastly, for fun, define motherhood! Love in its purest form. I believe our creator allows us to experience motherhood as a way to show us how much he loves us. Motherhood teaches mom and baby, builds character and is my biggest blessing. 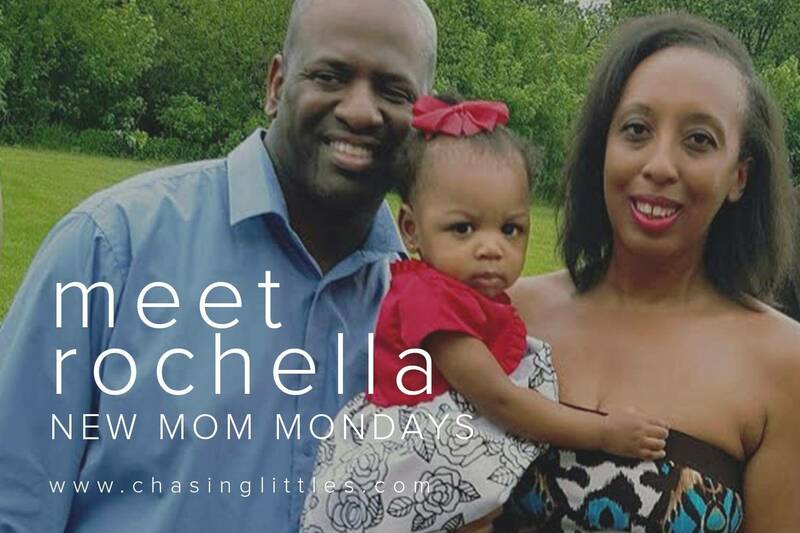 To hear more from Rochella be sure to visit her blog Career and Family Life . If you would like to participate in New Mom Mondays please feel free to message me by using my contact form! I would love to not only feature you on my blog but learn from your answers, as I’m sure many readers would too!